I've wanted to visit the LUSH Oxford Street flagship store for a while now so I was excited to finally get the chance to pop in and pick up some treats during my recent London trip. 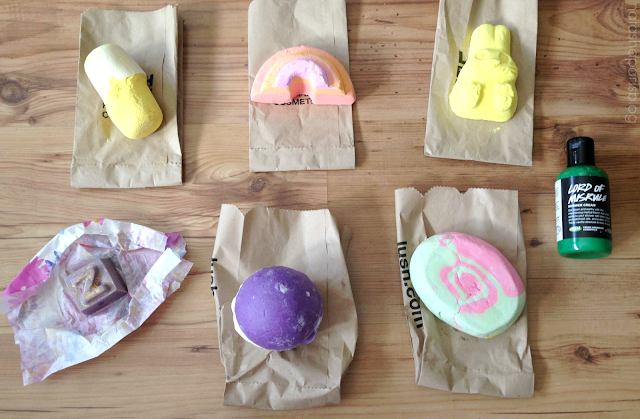 Rather than purchasing the same bath products that I always do, such as the Twilight bath bomb, I instead decided that I'd purchase some of the LUSH Oxford Street exclusive products as well as a couple of other items that I've not tried before. Most of the products I picked up were Bath Bombs. Cyanide Pill,Roller and Somewhere Over The Rainbow are all Oxford Street exclusives. I also picked up one of the new Easter Bath Bombs too, Spring Bunny. Each one of these products smells amazing and I can't wait to make my way through them all and I'm sure they'll feature in future blog/Instagram posts. As well as picking up some of the Oxford Street exclusive Bath Bombs I also bought a Bubble Bar,Supertramp, which is so bright and colourful and smells incredible. Whilst I was in store I also purchased a Dreamtime bath melt, which is a product which I've wanted to try for a while now, and I also purchased another 100g bottle of Lord Of Misrule Shower Gel, a product which was available in all stores around Halloween but is exclusive to the Oxford Street store for the time being. Have you visited LUSH Oxford Street? Or have you purchased anything from LUSH recently?